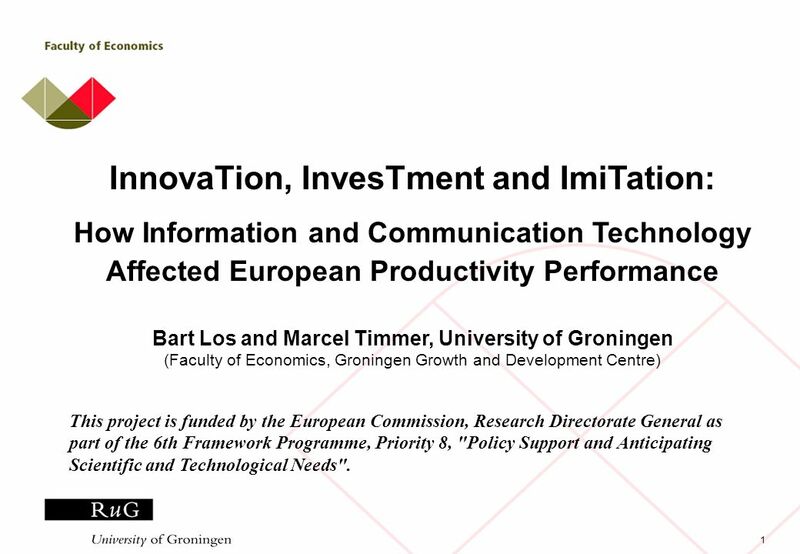 1 1 InnovaTion, InvesTment and ImiTation: How Information and Communication Technology Affected European Productivity Performance Bart Los and Marcel Timmer, University of Groningen (Faculty of Economics, Groningen Growth and Development Centre) This project is funded by the European Commission, Research Directorate General as part of the 6th Framework Programme, Priority 8, "Policy Support and Anticipating Scientific and Technological Needs". 5 5 This paper TFP should be divided into pure technological change (innovation) and efficiency changes (imitation) through estimation of global production frontier. 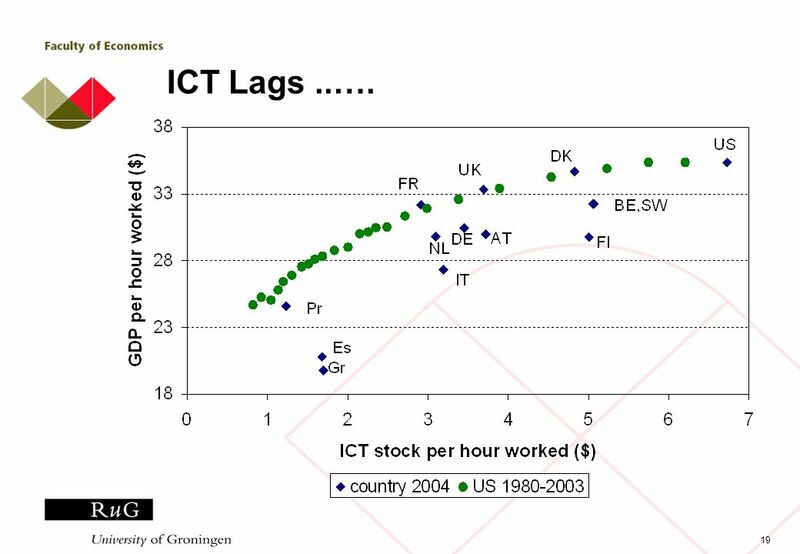 (see Los & Timmer, JDevE 2005, Timmer and Los, JPA 2005) ICT capital is a critical input Questions How many years are European countries lagging behind in ICT? 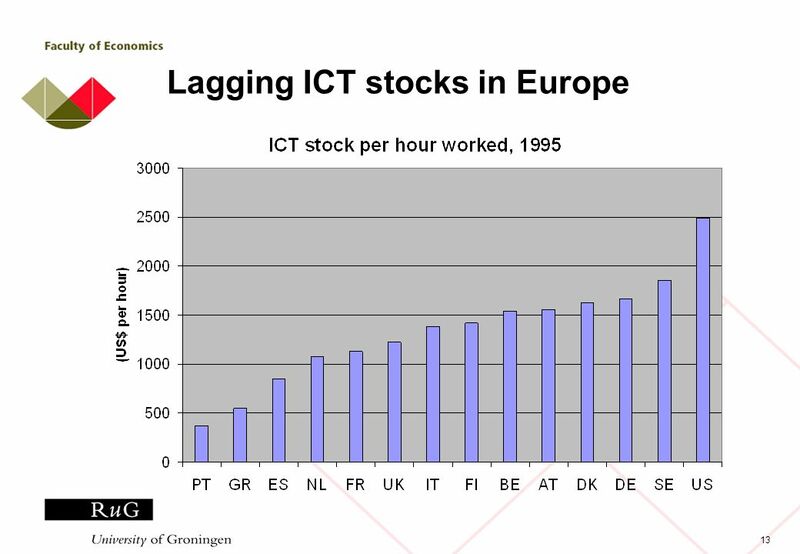 How efficient are European countries in using old-vintage ICT? Does this differ for various sectors? 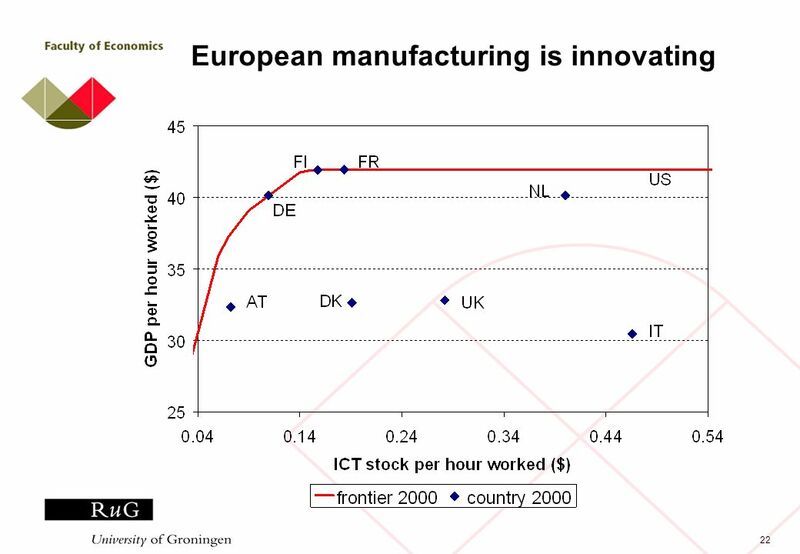 How much of European growth is due to innovation and how much due to imitation? 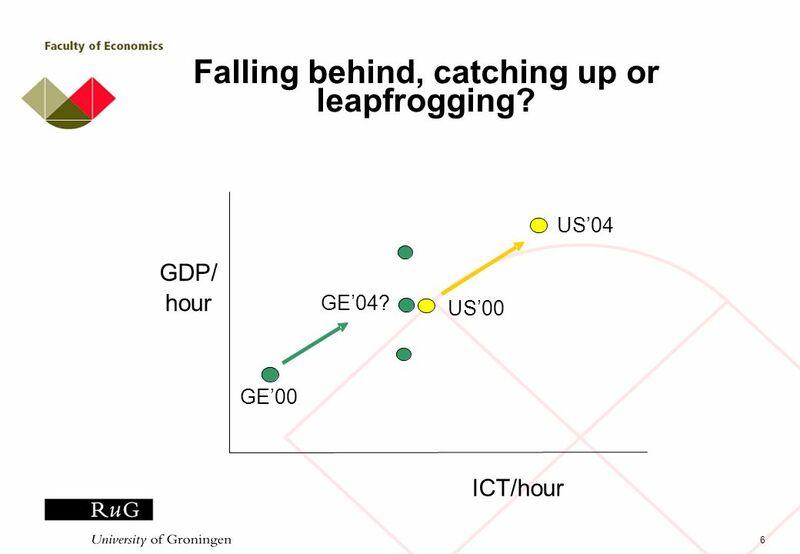 6 6 Falling behind, catching up or leapfrogging? 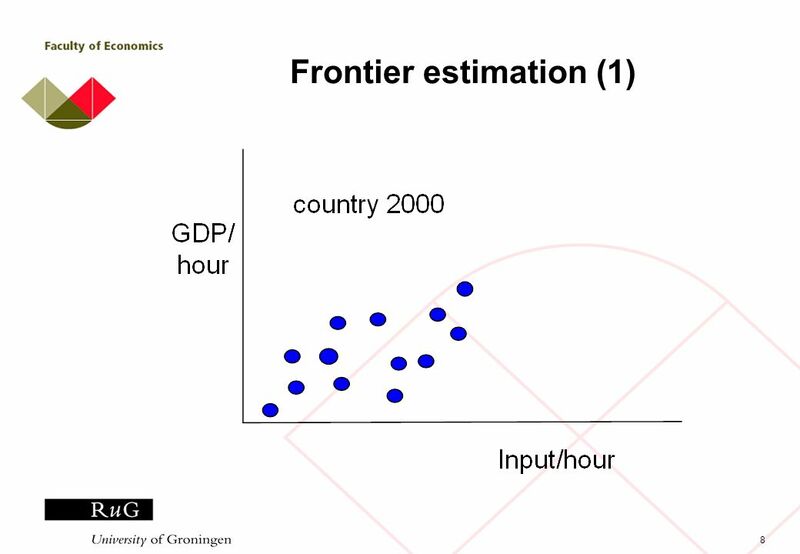 ICT/hour GDP/ hour GE00 US00 US04 GE04? 7 7 Frontier Estimation Data Envelopment Analysis on 1 output (GDP) and 3 inputs (labour, IT and non-IT), assuming CRS (Färe et all, 1994, AER) Non-parametric approach with very few restrictions on production technology Advantage is flexible functional form, which allows for localized technological change DEA with intertemporal dataset, to avoid technological regress. –Frontier for year y based on all observations from 1980 up to y –First frontier for 1990. 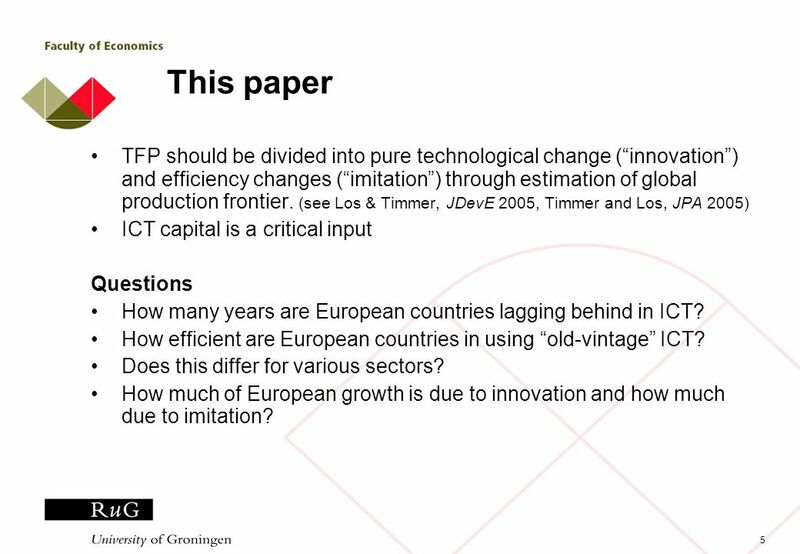 Download ppt "1 InnovaTion, InvesTment and ImiTation: How Information and Communication Technology Affected European Productivity Performance Bart Los and Marcel Timmer,"
Staatssekretariat für Wirtschaft Secrétariat dEtat à léconomie Segretariato di Stato dell'economia State Secretariat for Economic Affairs EVD / DFEFolie. 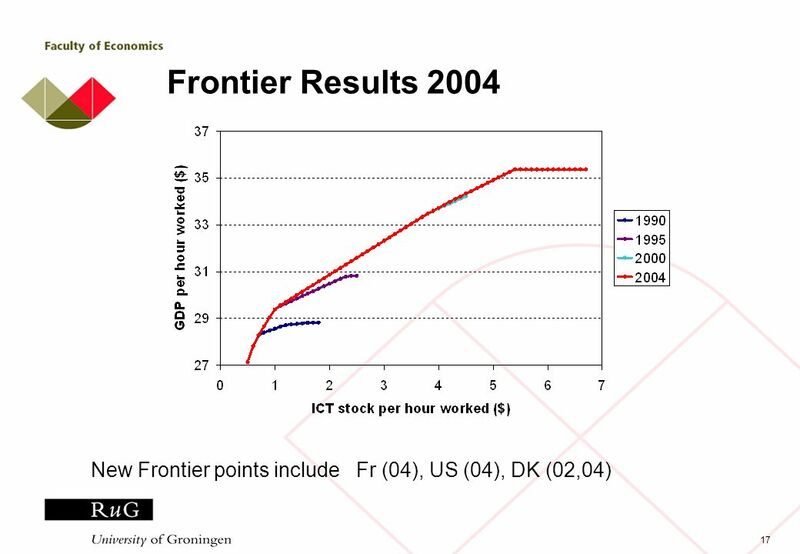 Using public procurement to foster research and innovation More Research and Innovation COM(2005) 488 of 12 October 2005 Commission communication to the. Introduction (business meeting) Second Consortium Meeting, 9-11 June 2005, Helsinki Bart van Ark Groningen Growth and Development Centre University of. 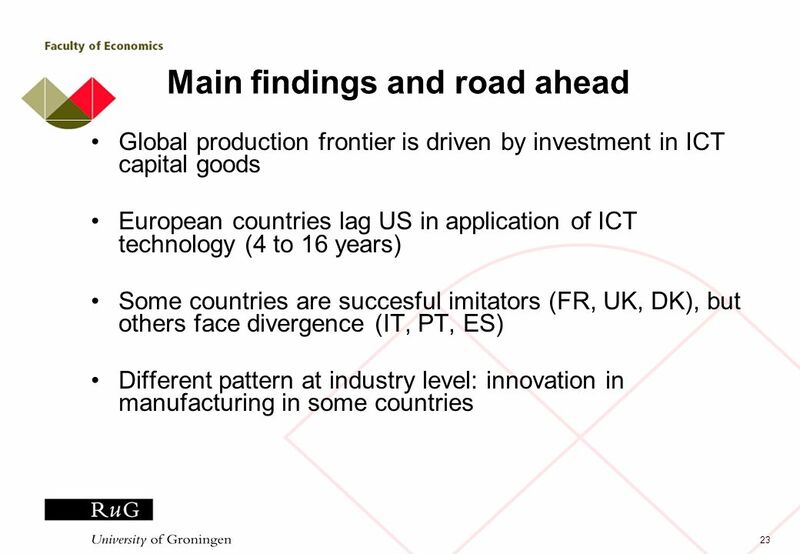 International Technological Specialization in Important Innovations: Some Industry-Level Explorations Carolina Castaldi* and Bart Los** *University of. 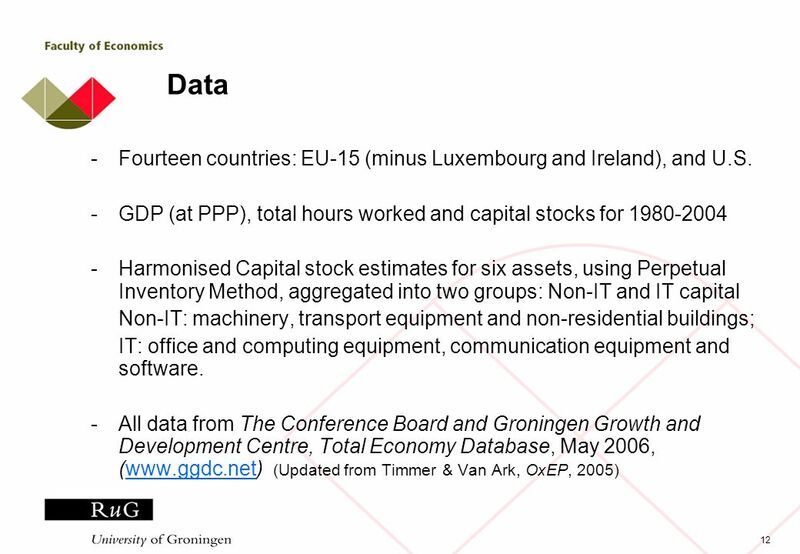 WP3 Capital accounts Data availability 9-11 th June 2005 Helsinki Ana Rincon NIESR This project is funded by the European Commission, Research Directorate. 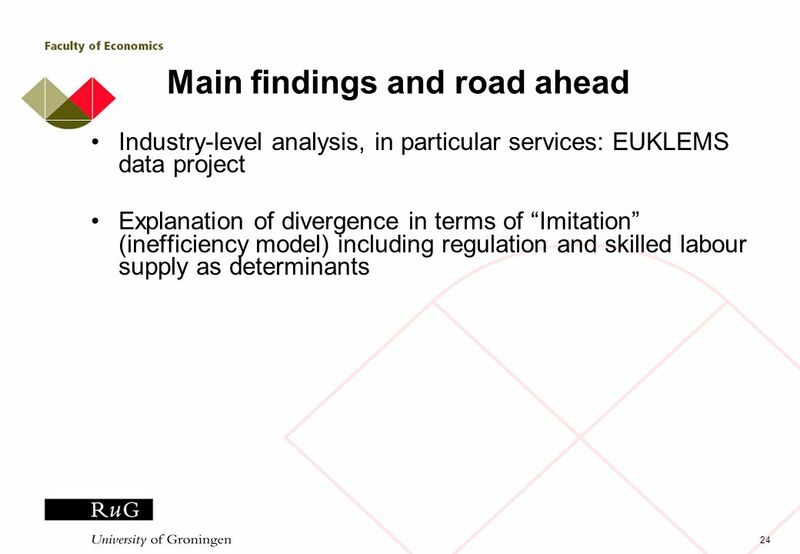 Outline Statistical Roadmap 9-11 June 2005, Helsinki Bart van Ark Groningen Growth and Development Centre University of Groningen This project is funded. 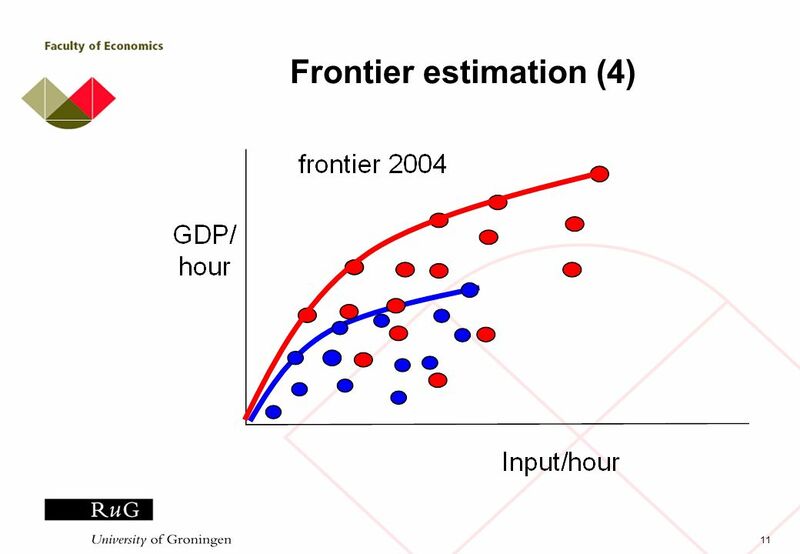 Growth and Productivity in the European Union Presentation for the EUKLEMS workshop, September 2006, Vienna Marcel Timmer, Groningen Growth of Development. 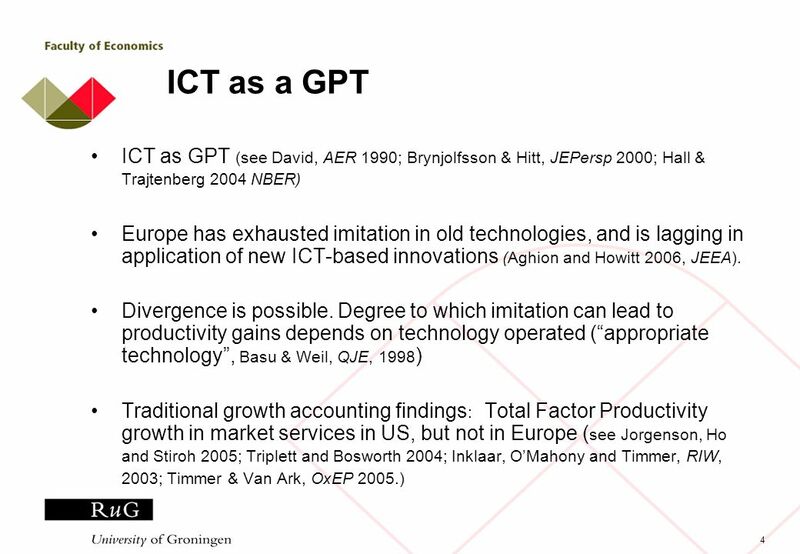 1 Matilde Mas & Javier Quesada London, October 26/27th ICT and Economic Growth in Spain EUKLEMS Project, Issues for discussion. 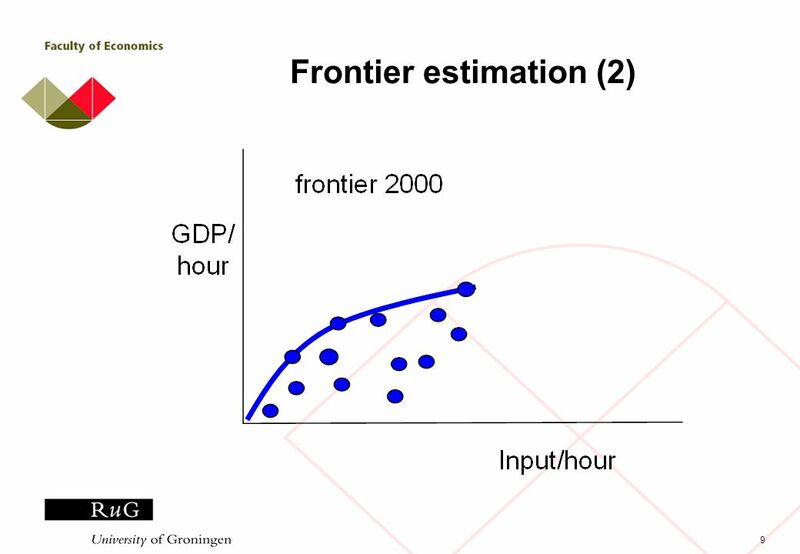 Capital stocks, capital services, and depreciation: an integrated framework Nicholas Oulton London School of Economics Sylaja Srinivasan Bank of England. 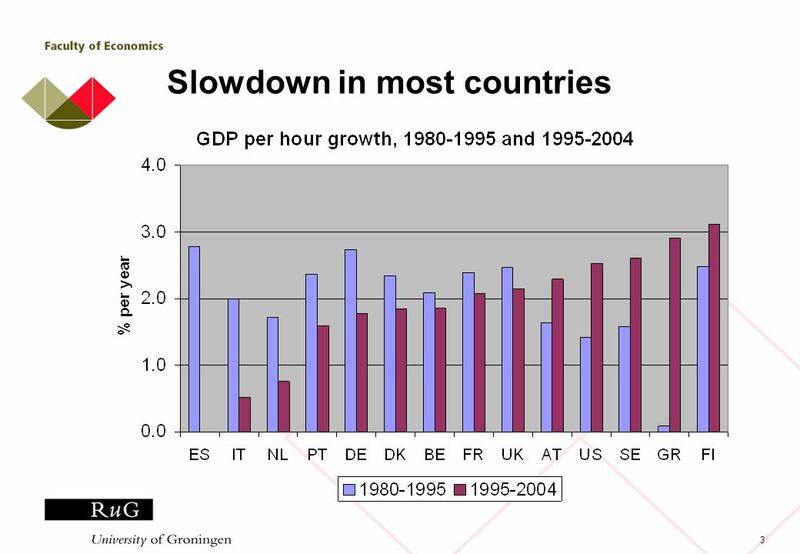 EU KLEMS project on Growth and Productivity in the European Union Presentation for the Economic Policy Committee 22 May 2006, Brussels Bart van Ark, Groningen. EU KLEMS project on Productivity in the European Union Presentation at EPROS meeting, Luxembourg, 8-9 November 2004, Luxembourg Bart van Ark (Groningen. 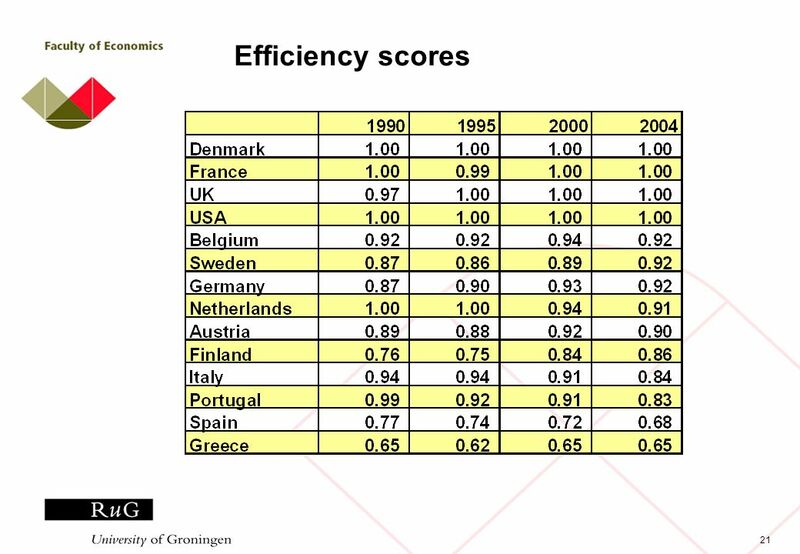 France, Germany and the UK Similarities, differences and prospects This research is funded by the European Commission, Research Directorate General as. 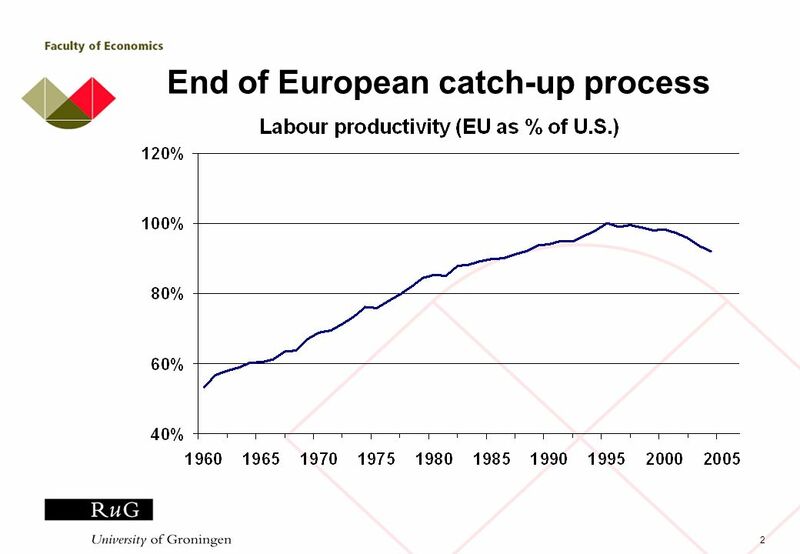 EU KLEMS project on Productivity in the European Union Summary presentation This project is funded by the European Commission, Research Directorate General.